Learn to trade with the man who literally wrote the book on options trading. 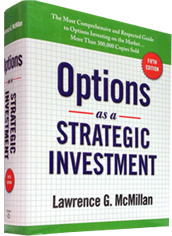 The McMillan Options Mentoring program is the one-on-one personalized option coaching program designed by Lawrence G. McMillan, the author of "the bible of options trading." Larry and his mentors are professional traders who have made their living in the options markets. The education you will receive from McMillan Mentoring is be based upon proven strategies and techniques, not theoretical book learning. Visit the Program Page to read more about what's included in each program. Once your program is chosen, you will then set up a schedule with your mentor for your customized online sessions. During the individual programs, you will get to study at your own pace and focus in the areas you need the most attention. This is not a high volume, mass prepared course. An individual curriculum is designed for each student based on his or her current level of knowledge, experience and interest. Each week, you will be given assignments as well as follow-up questions to make certain you understand the information being presented. If you have a particular need or weakness, we'll help you develop your skills in the areas that you wish to improve upon. Mentoring sessions will be conducted one-on-one with your mentor via online webinar and can be accessed on any computer with an Internet connection.